The hilly island of Syros - Siros - Σύρος lies half-way between Kythnos and Mykonos. Its central situation makes it the principal centre of administration, commerce and fisheries in the Cyclades and a focal point of the shipping routes in the Central Aegean. Agriculture makes a major con­tribution to the island's economy, supplemented in the last ten years by a rapidly developing tourist trade. 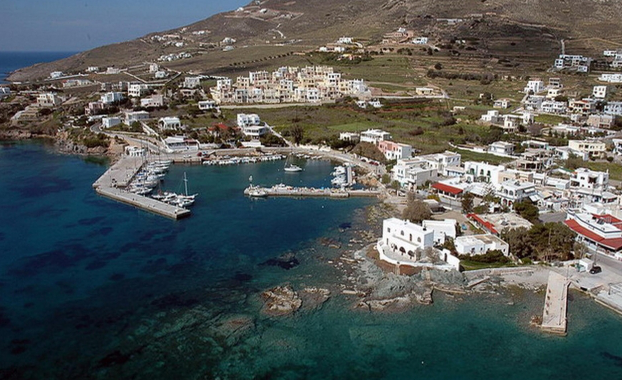 Both Ermoupolis and Finikas serve as practical yacht charter bases in the middle of the Cyclades, just like the Paroikia port on Paros. Indeed, for a sailing holiday there are several good bays to anchor: Varis in the south and Delfino, Megas Lakkos & Kini along the west coast. 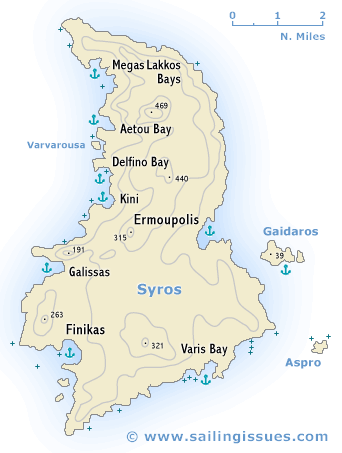 Moreover, the island of Gaidaros too has an excellent anchorage. The islands capital, Ermoupolis, named after Hermes, the Greek god of trade, occupies the site of an ancient settlement of which no trace remains. It is the seat of the Prefect of the Cyclades, a Roman Catholic bishop and an Orthodox archbishop. The town owes its present extent to Greek refugees from Chios, Psara, Crete, Hydra and other islands, who settled here in 1821, after the War of Liberation, and built the town up into a major port on the sea routes between Asia Minor and western Europe. At the end of the 19th c., however, the economy of the town suffered from the competition of Piraeus. From the time of the Fourth Crusade at the beginning of the 13th c. until 1568 Syros belonged to the Duchy of Naxos, and since that time it has had a substantial Roman Catholic minority, which during the Turkish period was under protection of France. During the War of Greek Independence the island remained neutral, and those who had escaped the massacres of Chios and Psara were able to find refuge here. Close to the town of Ano Syros, which was founded in the 13th c. and had remained predominantly Catholic, these new settlers established the town of Ermoupolis by the harbour, and this developed during the 19th c. into the largest Greek port, before being overtaken by Piraeus. ↑ Aerial photo Finikas port.